Every now and then a person comes into one’s life and makes a lasting impression. A good impression is preferred and York College of Pennsylvania was successful in the choice of Rebecca Quattrone as a professor of art appreciation and sculpture. She began her career at York in January of 2004 and feels fortunate to assist students in the art studio and in multiple independent studies. Rebecca is not only a teacher of art, but an accomplished artist herself with her work displayed in juried exhibits in the United States as well as internationally in her family’s home country of Italy. 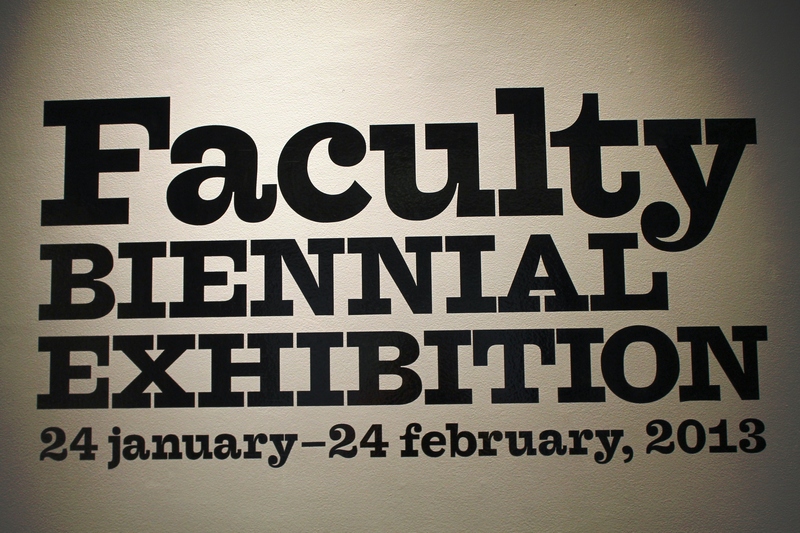 This month in Wolf Hall, Rebecca has two pieces in the faculty exhibit on display in the art gallery. 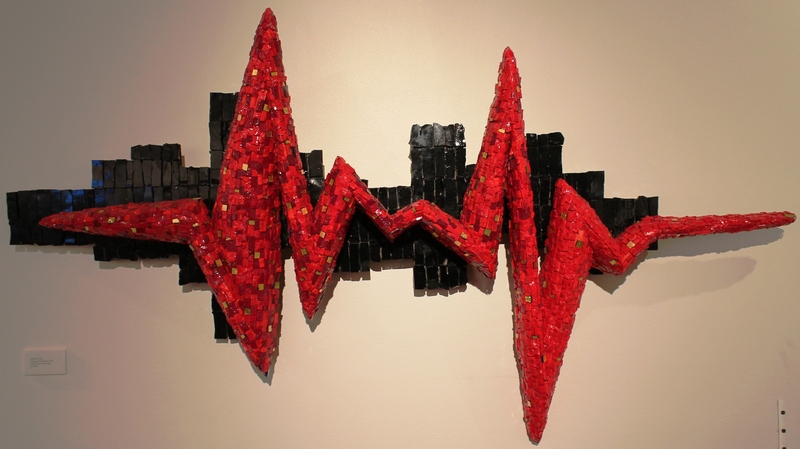 The first is a mosaic titled Battito which translates to Pulse. This piece “documents a difficult painful year in my life. It echoes my life as a heartbeat, a powerful entity that simultaneously enslaves and sustains.” The Byzantine mosaic is made of Italian smalti glass in black, red and blue. The blue tiles are painted with 24k gold leaf. These tiles represent her daughters Arie and Tess. 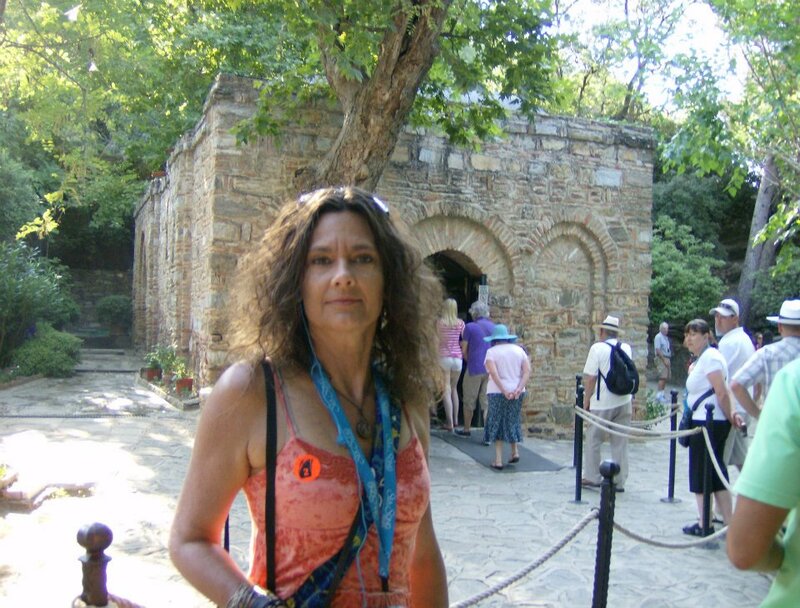 Rebecca hand-broke the glass purchased from Ravenna in Northern Italy and also the town where she studied under world-renowned Byzantine mosaic master, Luciana Notturni. The second piece titled Oz has multiple artistic forms. 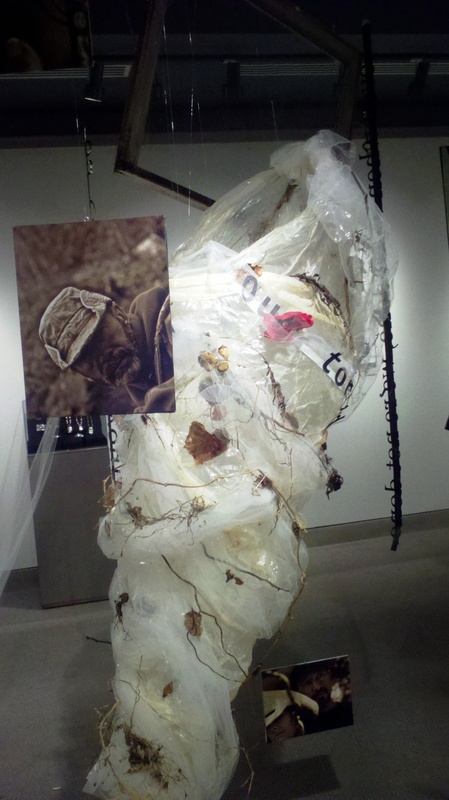 A combination of photography, sculpture, text and found art are captured in a tornado of fury. Rebecca had no need for a model of a tornado to create the one featured in Oz. This past summer she participated in a search and rescue mission after a tornado touched down and eight people were lost on the side of a mountain. It took over eight hours of exhausting work, clearing trees from the roads in the pouring rain and darkness. With chainsaws and muscle they had cleared the roads by 4:30 AM and everyone was located and returned safely to camp. 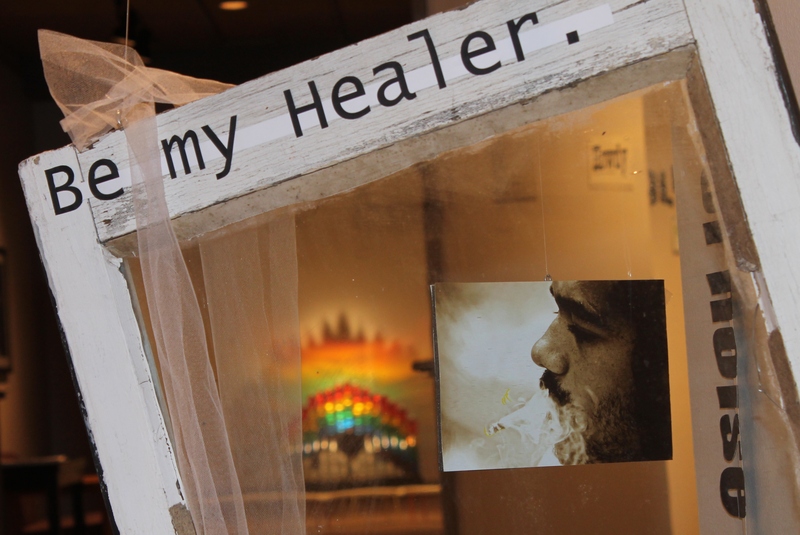 “The experience has changed my life forever in so, so many ways.” A life-changing event that has carried over into an exhibit that attempts to help others with changes in their lives. Oz took Rebecca fifteen months to create to help people feel they can share their secrets with Dorothy for the tornado to “take with it until it touches down again”. The tornado is made out of a very fragile material called tulle. It was stiffened with boiled glue and hung over a wire armature. After it dried, it was removed from the armature and assembled. “It was very important to me to use a material for the tornado that could present a sense of strength, while hiding it weaknesses, just like me.” The next Oz exhibit may even have the tornado spin. Rebecca has obtained an old disco ball but electrical outlets have to be in the ceiling in order for it to work. 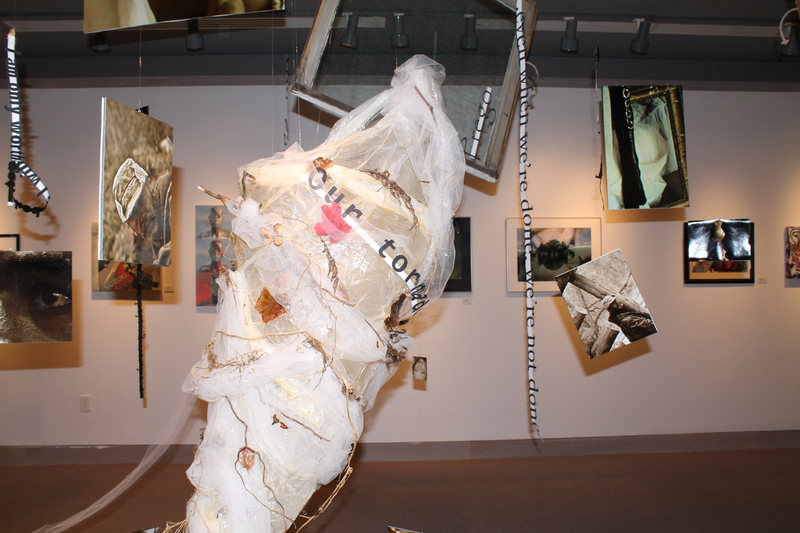 All gallery spaces are different making set-up of an interactive exhibit challenging but rewarding. Oz will literally travel from gallery to gallery. Its next venue is expected to be in the Baltimore or Washington D.C. area. 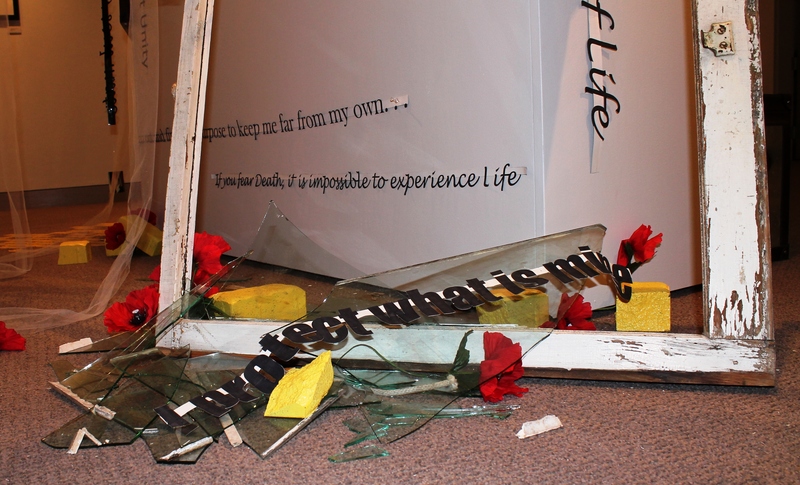 As the piece travels Rebecca will add to the graphic text quotes, a collection of voices of domestic violence victims, personal thoughts, and voices of those that let Dorothy a message in the box provided. Rebecca’s photo subjects, including her, are “people in my life, people I have met through Oz, and hopefully viewers that email me digital photos of themselves that will become FACES of Oz. This is a new element; one that I hope begins with YCP Oz.” Photos and messages may be submitted to Rebecca a.k.a Dorthy, at WelcometoOz2012@gmail.com to be included in future gallery shows. In Baum’s “The Wizard of Oz” Dorothy is trying to find her way home after a tornado swept her away. Rebecca stated the movie is “a metaphor for trying to discover who we are and what defines us, as well as finding our strengths which we thought were our weaknesses, i.e., our courage, our intelligence, our heart, etc. This exhibit will continue until we all find our way home, i.e., we find who we are, so I don’t see it ending.” Rebecca’s Oz exhibit will be on display until February 24th until it picks up and moves on to touch down in another town. A local nonprofit radio station, WITF, interviewed Rebecca. The hosts of the art and culture talk show Cary Burkett and Joe Ulrich invited Rebecca when Oz was on exhibit at the York Arts Studio in October of 2012. A portion of the interview can be heard at RADIO Interview. 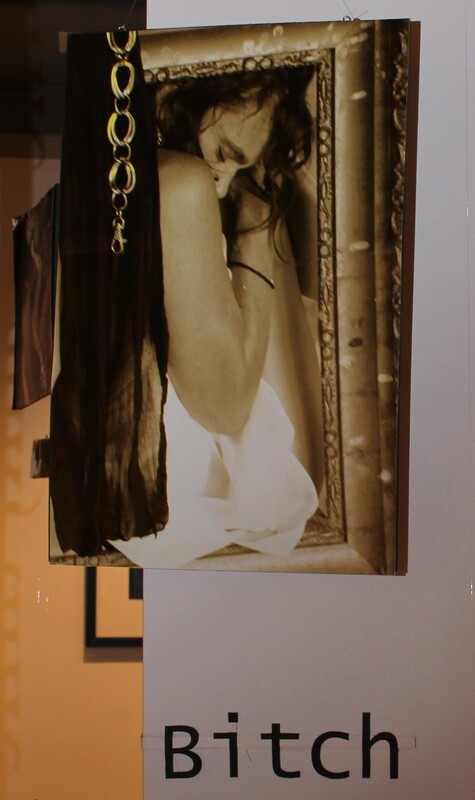 The article and interview can be found on the station website http://www.witf.org/arts-culture/2012/10/burdens-and-secrets-rebecca-quattrones-oz-art-exhibit.php. Rebecca is passionate about working with and teaching art skills to children that are visually impaired. 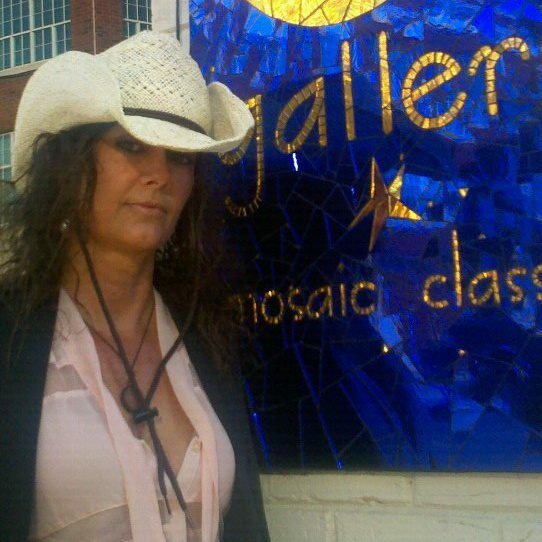 Currently she is in the final stages of a large-scale mosaic installation at ForSight Vision center in York, PA. The unveiling and dedication is scheduled for next month. 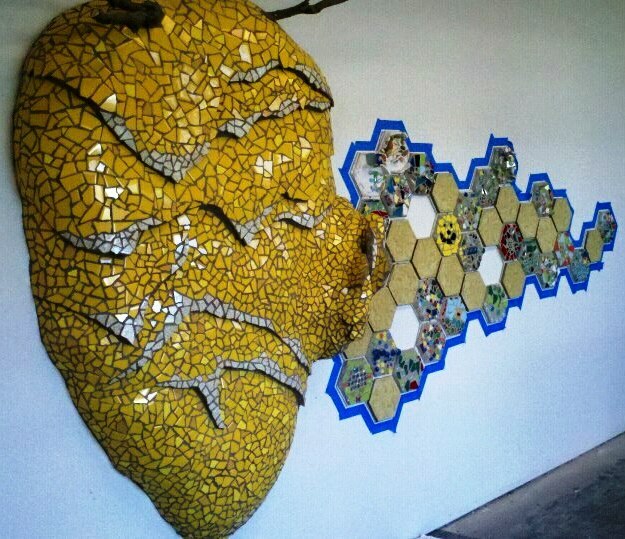 Rebecca explained, “The project is called the “Busy Bee Mosaic” and embodies the voices of the children of ForSight as documented in hexagon honeycomb mosaic cells that the children created to tell a story with their particular condition and experience. Mainly, I am providing an artistic platform and venue to tell their story, to provide a healing outlet and to provide awareness to the general public for people with visual impairments.” The specific date for the unveiling has not been determined. 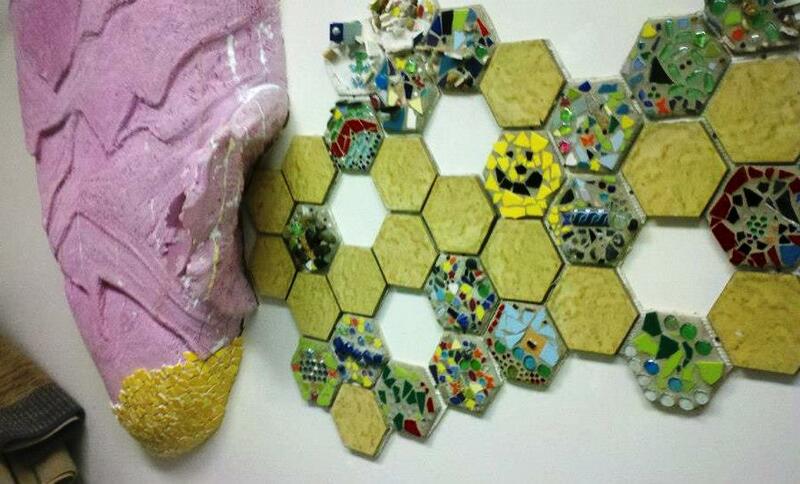 More information can be found on Facebook on the Busy Bee Mosaic Project page. The York Dispatch stopped on location and recorded the children busy at work on the mosaic project. A brief clip of Rebecca’s teaching process and the excitement of the children involved can be viewed here: As the Busy Bee Mosaic wraps up, Rebecca already has plans for new projects. There will be a revival of her previous work titled “Voices From the Wall” an interactive installation. 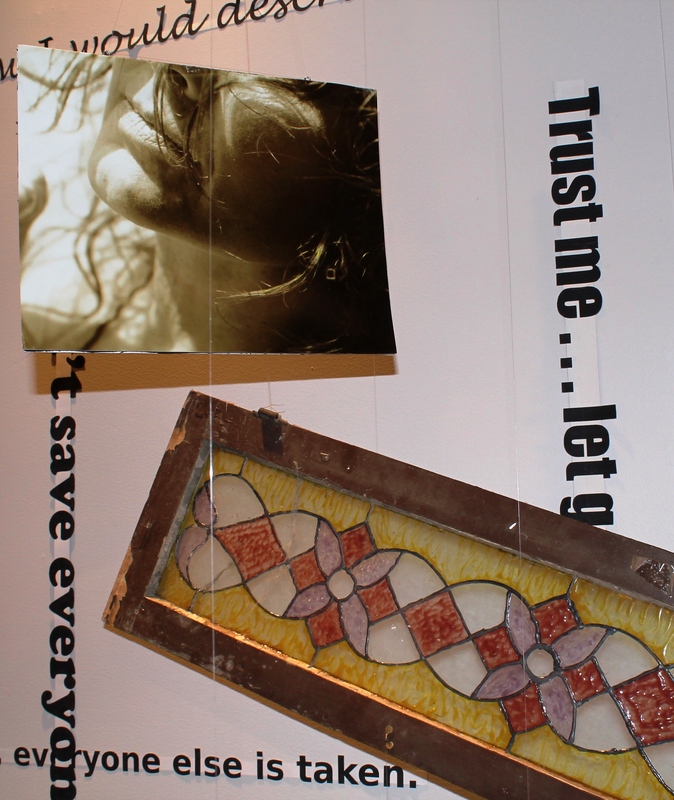 This exhibit is for domestic violence victims, their families, and to generate public awareness about spousal abuse. Rebecca, a person that appears to have endless amounts energy to reach out and help others, has two proposed mosaic projects in the works. One for Big Brothers, Big Sisters of York and another with Crispus Attucks of York for their Wingstock 2013 fundraiser slated for July 6th. It is Rebecca’s outgoing personality combined with her dedication to teaching and sharing her artistic abilities that make her a remarkable person. A person you want to know, to share your thoughts with and listen to her wisdom. The relaxed atmosphere in her classroom allows students to speak up and share their thoughts and ideas. The critiquing process every student must participate in offers the opportunity to share their art, what inspired their piece and receive feedback in a non-threatening environment. Both verbal and written comments are given to the artist that may be helpful in changes to or improvements of their work. The critiques are not a painful process, but instead a give and take moment between artist and viewer. The pressure is off because even if you feel your work looks more like a pile of poo than a sculpture of a snake, Rebecca will find the positive in that piece and make you smile. She brings out the positive in the people she is around. From the art studio at York College to the many personal projects she takes on, she adds a spark of excitement that can only be experienced, not explained. She is a small package that carries an endless amount of energy, ideas and inspirations. Once you have met this mother, this artist, this professor with a purpose, you will never forget her or her works of art. Because you have been embraced, accepted and connected to and with Rebecca Quattrone.